Pumpkin pie frozen custard at Shake Shack | I dream of having one hollow leg. I dream of having one hollow leg. I don’t do pumpkin spice lattes, but I admit to loving this time of the year when that large orange squash becomes front and centre in baking and desserts. This is largely because pumpkin pie might be my number one dessert. Pastry, custard, spices, a required topping of freshly whipped cream. All things that make me very happy. Cold, creamy desserts might rank number two. But there is a hierarchy of favourites within: Gelato, soft-serve, hard ice cream. In a cone. Always. Since moving to New York and having easy access to frozen custard (it’s heavier on the egg yolks than ice cream) via Shake Shack, I have found a place for it among the faves after gelato. It’s the texture I cannot get enough of. It has the smoothness of soft-serve and the firmness of hard ice cream. Given that I’m partial to cones, I enjoy how my tongue glides effortlessly to shape my scoop yet it doesn’t make a huge dent with a single lick. Yes, I think about these things. Chocolate and vanilla are always available, but there is also a rotating daily flavour that Shake Shack creates on a Monday-Sunday roster. Of course, pumpkin pie custard easily won my heart with its perfect blend of actual pumpkin and seasonal spices. It shows up for both October and November. I doubt I’ll get 8/8 weeks, but I certainly will try. 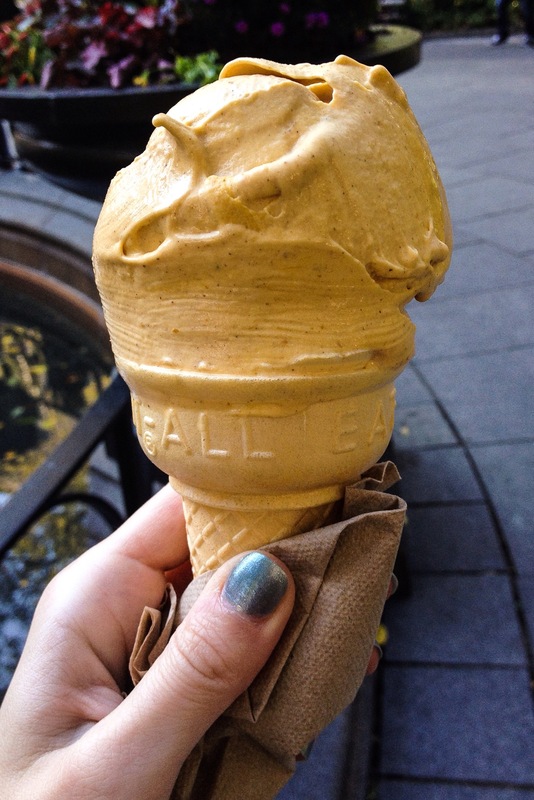 Pro tip: The Madison Square Park location always gives the most generous scoops. This entry was posted in Eating Out: NYC on October 7, 2014 by historicalartfox.